How Do UV Pool Sanitizers Work? SpectraLight turns pool maintenance nightmares into pool maintenance freedom. And UV does it better than anything else on the market. SpectraLight UV harnesses the power of ultraviolet light to eliminate microorganisms, lower chemical usage, and eliminate toxic by-products. With SpectraLight UV, your spa or hot tub will be safer, healthier, and easier to manage than traditional sanitation methods. What is an Ultraviolet (UV) Pool Sanitizer? Ultraviolet (UV) pool sanitizers utilize a cutting-edge, non-chemical process that uses germicidal UV light rays to sanitize water, air and surfaces that may be contaminated. Ultraviolet pool sanitizers emit a high intensity germicidal light ray that alters or disrupts the DNA or RNA of targeted organisms such as algae, bacteria, viruses, cysts and protozoa. The highly concentrated electromagnetic energy also destroys organic matter, eliminating the formation of dangerous chlorine by-products. Where Did UV Sanitizers Get Their Start? The UV light spectrum was discovered with the identification of light waves. Scientists have known for almost a century that UV is a powerful neutralizer of algae, bacteria and viruses. 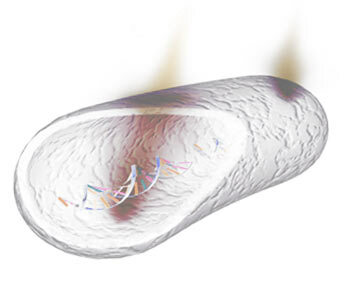 They also discovered that the optimal ultraviolet wavelength to destroy microorganisms was between 250 and 270 nm. The results led scientists to incorporate Ultraviolet sanitizer technology into sterilizing drinking water more than 30 years ago. Ultraviolet disinfection has since gained in popularity in drinking water and wastewater disinfection in the last 10 years. Now ultraviolet sanitizers disinfect a significant percentage of all drinking and wastewater. The big news is that New York City has designed the world's largest drinking water facility, capable of treating two billion gallons per day. New York will install twelve thousand ultraviolet lamps - the same type of lamps found in SpectraLight UV sanitizers. 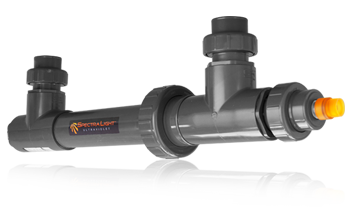 SpectraLight is installed in-line just after your pools existing filtration system. SpectraLight bombards the passing water flow with a high intensity germicidal ultraviolet ray that destroys more than 60 waterborne pathogens, including algae, bacteria, cysts, and viruses. The UV sanitizing lamp is housed in an industrial graphite housing optimized for high flow rates. A highly specialized quartz glass sleeve protects the lamp from passing water while transmitting 99.9% of the UV light. The highly concentrated electromagnetic energy destroys organic matter and eliminates the formation of dangerous chlorine by-products called chloramines that commonly lead to red, stinging eyes, skin irritations, asthma and allergies. This energy penetrates the cell walls of bacteria, viruses, algae, cysts and all pathogens. That's right: no pathogen can escape a powerful dose of UV from a SpectraLight sterilizer. Ultraviolet sanitizers are very safe. 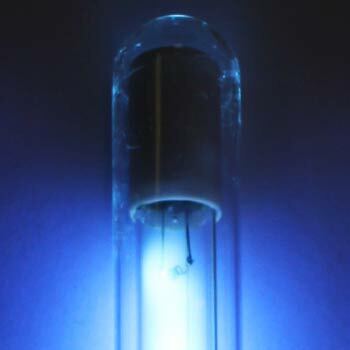 The ultraviolet lamps are housed in a rugged high-impact polymer housing. UV cannot leave or escape the sterilization chamber, so UV never enters the swimming pool. UV is a physical process rather than a chemical process, making UV the most environmentally friendly choice in pool sanitation. There is no residual effect that is harmful to humans, animals, aquatic life, plant life or the environment. UV also minimizes the need to generate, handle, transport, or store dangerous chemicals. "About 80% of new water parks and aquatic facilities feature ultraviolet." Ultraviolet is considered the best available technology for swimming pool disinfection. Studies show that in chemical disinfection, 90% of the chemicals are used for oxidation, and 10% for sanitation. Ultraviolet does both. Did you notice the enviable water quality at the Olympic games? The underwater cameras were able to shoot clearly across the entire pool. The secret? Ultraviolet disinfection. The secret is out, and now hundreds of commercial aquatic centers across the nation have installed UV. These systems often cost between $50,000. and $100,000. But the UV systems for residential pools are smaller is size and scale. And SpectraLight has made UV systems affordable for the average family pool. What Do the Authorities on Water Purification Say About UV? According to the United States EPA, "...UV has been found to be an effective disinfectant...simplicity of installation, ease of operation and maintenance, and low cost relative to chemical disinfection make UV a useful technology..." According to the World Health Organization, "Lower free chlorine concentrations may be health protective when UV is used." Some states are beginning to require UV on public pools. The state of New York recently mandated ultraviolet pool systems use on all public spray parks. There are a number of alternatives for swimming pool sanitation. Compare UV to chlorine, ozone, ionization and other technologies here.